The big news of 2004 was the discovery by scientists of a new and tiny species of human which lived in Indonesia at the same time as Homo sapiens was colonising the world. Homo floresiensis was a one metre-tall species (three feet) which lived on Flores Island (near Java) between 95,000 to at least 12,000 years ago. Australian archaeologists unearthed the bones while digging at a site called Liang Bua, one of numerous limestone caves on Flores. The remains of the partial skeleton were found at a depth of 5.9m (nineteen feet). At first, the researchers thought it was the body of a child. But further investigation revealed otherwise. Wear on the teeth and growth lines on the skull confirmed that it was an adult. Features of the pelvis identified it as female, and a leg bone confirmed that it walked upright. The 18,000-year-old specimen, known as Liang Bua 1 or LB1, was assigned this new species name of Homo floresiensis. It had long arms and a skull the size of a large grapefruit. The researchers have since found remains belonging to six other individuals from the same species. LB1 shared its island with a golden retriever-sized rat, giant tortoises, and huge lizards - including Komodo dragons - and a pony-sized dwarf elephant called stegodon which floresiensis probably hunted. According to Chris Stringer, head of human origins at London's Natural History Museum, the long arms were an intriguing feature and may even suggest that floresiensis spent much of its time in the trees. It was not known for certain, but if there were Komodo dragons about on the ground then floresiensis may want to be up in the trees with its offspring safe and sound. This was something for future research to follow up, but the fact that they had long arms is at least suggestive of such behaviour. 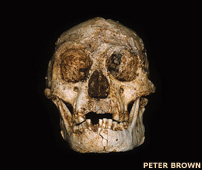 Floresiensis probably evolved from Homo erectus, whose remains have been discovered on the Indonesian island of Java. Homo erectus may have arrived on Flores about one million years ago, evolving its tiny physique in the isolation provided by the island in response to the local scarcity of resources. What is surprising about this is that this species must have made it to Flores over open water. Building craft for travel on water is traditionally thought to have been beyond the intellectual abilities of erectus, so perhaps one group managed to use materials provided by nature. Even more intriguing is the fact that Flores' modern inhabitants have incredibly detailed legends about the existence of little people on the island whom they call Ebu Gogo. The islanders describe the Ebu Gogo as being about one metre tall, hairy, and prone to 'murmuring' to each other in some form of language. They were also able to repeat what islanders said to them in a parrot-like fashion. LB1 was an adult female which stood just one metre in height. The specimen was found at a depth of 5.9m in the limestone cave of Liang Bua on Flores, Indonesia. The last evidence of this hominid at Liang Bua dates to just before 12,000 years ago, when a volcanic eruption snuffed out much of Flores' unique wildlife. Yet there are hints that floresiensis could have lived on much later than this. The last legend featuring the mythical creatures dates to just a century ago. But Henry Gee, senior editor at Nature magazine, went somewhat further. He speculated that species like floresiensis may still exist, somewhere in the unexplored tropical forest of Indonesia. The sophistication of stone tools found with floresiensis surprised some scientists, given the human's small brain size of 380cc (around the same size as a chimpanzee). It seems most likely that they inherited the skill of making such tools from their (probable) Homo erectus ancestors, rather than developing it themselves. Because the remains are relatively recent and not fossilised, scientists are even hopeful that they may yield DNA, which could provide an entirely new perspective on the evolution of the human lineage. The fact that these little people feature in the legends of modern Flores islanders suggested that tales of leprechauns and yeti may need to be taken more seriously.